Destroying Mummy Masks and the Oldest Known Copy of the Gospel of Mark? Update: Article by Candida Moss and Joel Baden for CNN that nicely summarizes more of the facts here. The first any of us heard of a new discovery of the fragment of the New Testament Gospel of Mark dating to the late 1st century C.E. was in 2012. Bart Ehrman of UNC and Daniel Wallace of Dallas Theological Seminary were engaged in a debate in Chapel Hill on the question “Is the Original New Testament Lost?” Wallace simply asserted his “bombshell” claim without giving any details. The debate is available on Youtube here. Our earliest physical manuscript of any part of the N.T. is a tiny papyrus fragment (3.5 x 2 inches, seven lines, front and back) from the Gospel of John known as Rylands P52, now on display in the John Rylands University Library in Manchester, UK. It is usually dated, with some controversy, between 117-150 C.E. Following Wallace’s “leak” lots of blog posts appeared, including this more recent one by Brice C. Jones who alarmingly reported the involvement of evangelical Christian apologist Josh McDowell, who has no academic credentials. Here he unabashedly and gloatingly defends this destruction of antiquities, see video here (See at timemark 24:23 where Josh scoffs at the destructive process: “Scholars die when they hear this but we own them.”). Another evangelical defender of the process wrote just this week that “archaeology is inherently destructive,” as if artifacts themselves are destroyed rather than carefully preserved by responsible archaeologists. Last summer I gave a presentation on the number, age, and reliability of New Testament manuscripts. In this lecture I described the effort under way in recent years to recover manuscript fragments, including biblical manuscripts, from ancient cartonnage, including mummy masks. All of these materials are from Egypt. Just over three years ago a fragment of Mark was recovered, which those studying it think dates to the 80s. If they are correct, this will be the first New Testament manuscript that dates to the first century. The fragment is to be published later this year (by E. J. Brill). Someone video-recorded my lecture and posted it on YouTube. Last week a reporter, Owen Jarus, from Live Science contacted me and I gave him an interview. What he wrote was posted on Sunday 18 January 2015 and is accurate. However, other journalists have made use of his story and/or the video on YouTube and have misunderstood some aspects of it, claiming incorrectly that I was myself the discoverer of the fragment of Mark or that research on the papyri recovered from the mummy masks is going on here in Nova Scotia. Some have also posted a photo of a mummy mask giving me credit for the photo. The photo is not mine. I have directed reporters who inquired to the person to whom the photo does belong. Unfortunately, not all reporters inquired. The Live Science link is http://www.livescience.com/49489-oldest-known-gospel-mummy-mask.html. 1) Since it is believed the gospel of Mark was written in Rome, does it surprise you that a copy written so soon after the original would have made its way to an Egyptian mummy mask? No. In the Roman Empire mail moved almost as quickly as it does today. A letter put aboard a packet in Ephesus (today’s Turkey) could be in Egypt within one week. Something written in Rome could be in Egypt being read within a few weeks. Mark was written in the late 60s, so finding a copy of Mark in Egypt dating to the 80s is not strange in the least. 2) Does dating indicate when the text was incorporated into the mummy mask? There are four important dates: (1) the date of the papyrus, (2) the date when ink was applied to the papyrus, (3) the date when the writing went out of use, and (4) the date when the no-longer-used writing was dismantled and used for the making of a mummy mask or some other form of cartonnage. Because some of the papyrus used in these masks are letters or business papers, we sometimes find dates, which is a big help. The style of handwriting helps date the papyrus. Features of the mask (e.g., its design and artwork) can sometimes help date it. A date in the tomb or in the sarcophagus can be very helpful. Carbon-14 can be helpful. All of these methods can potentially come into play in attempting to date the mask and then the earlier dates of the various papyri that were used later in making the mask. 3) How many such masks are currently in the possession of scientists? I do not know. There are several thousand of them, many hundreds on display in museums. Many in private collections. Many of them are of poor quality. These are the ones that are being taken apart, in order to recover written text. 4) If the original owners retain possession of the texts after they have been analyzed what will likely happen to them? Hard to say. We hope they will be placed on exhibit in museums. 5) Since we don’t really hear much about first century evangelistic endeavors in Egypt, does it surprise you that so many texts are being found in mummy masks? Not at all. The ancient world was far more literate than we moderns realize. Some 500,000 pages of papyrus have been recovered from Oxyrhynchus alone and it was not an especially important or cultured city. We have this enormous amount of material simply because the arid climate made preservation possible. There would have been millions of documents in other cities like Ephesus, Alexandria, Rome, Rhodes, and the like. 6) The article posted by NBC News said you believe the original writings of the gospels were in circulation for as long as 200 years. What leads you to believe that is true? For two reasons: (1) Church fathers, writing 150 to 200 years after the originals were written, refer to the autographs as still available in their time. (2) Several libraries and book collections have been recovered which provide compelling evidence. For example, a collection is found in a layer of the Oxyrhynchus landfill that is dated to the fourth century C.E., yet the books that are recovered were produced in the first and second century C.E. This shows that the library was in use for at least 200 years before being retired. Many books, including old Christian Bibles, have been found to have been read, corrected, repaired for more than 500 years. Several Bible scrolls from Qumran (i.e., the Dead Sea Scrolls) were at least 200 years old before the Qumran community was destroyed by the Romans in the first century C.E. In my two recent posts I briefly questioned the assumptions associated with the term “supernatural.” From a philosophical standpoint I would argue that what is needed is not so much a rejection of the supernatural as a redefining thereof. On the other hand, I am not a philosopher but a historian of ancient Judaism and early Christianity. In that role the charge I most often hear from readers who identify themselves as Christian “believers” is that historians “reject the supernatural.” In other words, historians begin with what are labeled as “naturalistic” presuppositions and thus end up rejecting a priori, the very possibility of the incarnation, the virgin birth of Jesus, his miracles, his atoning death, his bodily resurrection, and his ascent to heaven–in other words all the theological affirmations of the Apostles’ or Nicean Creeds. I have addressed this issue quite recently here, but want to expand a bit in some different directions. “The heart has its reasons, which reason does not know.” This famous line from Pascal’s Pensées draws a wise distinction between religious faith and intellectual inquiry. The two have different motivations and pertain to different domains of experience. They are like oil and water, things that do not mix and should not be confused. Pascal was a brilliant mathematician, and he did not allow his Catholic beliefs to interfere with his scholarly investigations. He regarded the authority of the church to be meaningless in such matters. He argued that “all the powers in the world can by their authority no more persuade people of a point of fact than they can change it.”1 That is to say, facts are facts, and faith has no business dealing in the world of facts. Faith resides in the heart and in one’s way of living in the world. I have to side largely with Hendel on this issue. As I often tell my students, good history is never the enemy of informed faith, but I don’t see my job as a historian of religions to sort out the faith issues for people–or even to deal with them at all. This is not to say that people who hold such faith are stupid or uninformed, but rather that faith and history are separate ways of looking at religions. Other than a few clerics, every major scholar of whom I am aware in the field of “studies of the historical Jesus,” shares the same basic historical methods and presuppositions. This is not to say we all agree on conclusions, but we are clear on the methods of historical research and what counts for evidence. Historical descriptive work in the area of religions is not in the business of evaluating truth claims, but in honestly and objectively tracing and reporting the rise and development of such views. In other words, it is not my role as a historian to say “Yes, Jesus rose from the dead, and those testimonies in Paul’s 1 Corinthian letter, and at the end of Matthew, Luke, and John are verifiable historical truth and I urge others to believe them so they can have eternal life.” Such personal testimony of faith would surely not make me a “true scholar,” in fact it would be quite the opposite. Imagine if a professor teaching the history of Islam began a class by endorsing Allah as the one God, Mohammed as his infallible Prophet, and the many “undeniable proofs” of the Koran’s perfection. One could hardly call such an approach “history” and any good university would never hire such a teacher, and rightly so. The historical investigation of Christianity, or any religion for that matter, should be no different. There are many places and situations in which such faith affirmations are appropriate but certainly not in the academic study of religion. Both my two latest books, The Jesus Dynasty, and The Jesus Discovery, reflect the methods and assumptions with which historians commonly operate as they describe and trace the history and development of a religious tradition. Our job is not to evaluate and endorse spiritual truth, but rather to offer the best possible account we can of the history and development of a given tradition. In point of fact, I do not “reject the supernatural,” (so much as “redefine” it) but such personal philosophical or theological views have nothing to do with my work as an historian. The guiding question of my recent work has been–what can be responsibly said about the historical Jesus? Affirming a belief that Jesus had no human father or that he rose bodily up to heaven in the clouds following his death, would take one totally out of the realm of what can be investigated historically. In my books I wanted to “come clean” with the reader in this regard and be clear about the differences between history and faith. What is rather frightening is to imagine such views of the supernatural becoming a part of the wider academic world–or God forbid, our Republic government, where Christian faith and dogma are treated as historical fact, and thus “required” as part of legislation and curricula. Thank God for the Enlightenment and the skeptical “deism” of our founding fathers and mothers in formulating the 1st Amendment. Unfortunately about three quarters of the world has still not learned the lesson of separating “religion” and the “state,” and even in Europe, which is surely proud of its secularism in contrast to the United States, still nonetheless has retained the fetters of a Church based system. Ironically, as witnessed by our own culture, a “secular” Republic does not mean the end of religion–far from it. In fact the free exchange of all ideas allows religions of every stripe and measure to thrive. Thank you John Locke, Thomas Jefferson, and all the rest. I think the main problem in discussions between theists and atheists is the assumption that static categories like “the Divine,” the “supernatural,” the “natural,” and the “material” exist other than as our dualistic semantic projections upon the whole of reality as we can perceive it. Our experiences are never reductionistically “materialistic,” even in the proverbial “hard, cold” lab. Process theism, by whatever name (Whitehead, Hartshorne) seems a better way of thinking about our “reality” even if “God” might not be the word one choses to use given the connotations from “Classic” theism (omniscience and omnipotence). Stain of Stupidity? Was the James Ossuary Inscription Damaged by the IAA Tests? It could be the earliest inscription of the word “Jesus” ever found, but we may never know. In their fruitless zeal to prove that the inscription “James, son of Joseph, brother of Jesus” was forged by Oded Golan or an Egyptian craftsman working under his direction, the Israel Antiquities Authority permitted a series of destructive tests that proved nothing and may have destroyed the chances of ever knowing the truth. The worst contamination can be seen in the reddish stain now smeared across the word “Yeshua” (Jesus) in the photograph above. Has Archaeology Gone Overboard in Throwing Out the Bible? A very good question with a complex set of possible answers! There is a very provocative and thoughtful post on the American Schools of Oriental Research (ASOR) blog & newsletter by my good friend Steven Collins (of “Sodom and Gomorrah” fame) by the above title. The relationship between archaeology and the Bible has been a much-debated topic over the last 25 years. The terms ‘minimalists’ and ‘maximalists’ are now as frequent as ‘exodus’ and ‘epigraphy’. The author at a nearby dolman with Tall el-Hammam in the background. Photo courtesy Steven Collins. There seems to be little or no middle ground. 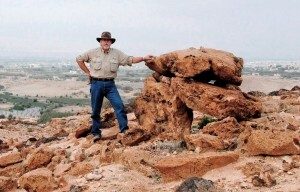 On the one hand, William Dever is—as he has stated on several occasions—flattered to have the death of biblical archaeology ascribed to him, although he is quick to point out that, in fact, he “only wrote the obituary.” On the other hand, Bryant Wood takes those to the ‘left’ of him to task for not holding to a ‘literal’ interpretation of the Genesis patriarchal lifespan numbers and an early (ca. 15thcentury BCE) date for the Israelite exodus from Egypt. While Israel Finkelstein has long abandoned looking to the Bible for any authentic historical information that might shed light on the ‘actual’ origin(s) of Israel, Eilat Mazar announces the discovery of King David’s palace in the archaeological excavations of the Iron Age city presently bearing his name. The Bible is pronounced both ‘boon’ and ‘bust’ by scholars of equal acumen! Two theoretical physicists who suggested that an invisible ocean of energy suffusing space is responsible for the mass and diversity of the particles in the universe won the Nobel Prize in Physics on Tuesday morning. They are Peter Higgs, 84, of the University of Edinburgh in Scotland, and François Englert, 80, of the University Libre de Bruxelles in Belgium. I have previously written several posts about the quest for the so-called “God particle” since its celebratory discovery last 4th of July, see here with links. That these two distinguished scientists are both in their 80s, with the Nobel Prize marking a culmination of a lifetime quest makes the award and its important implications all the more impressive. Unfortunately the popular misnomer, “the God particle,” coined by the publisher of a book by Nobel Prize-winning physicist Leon Lederman, has caused widespread misunderstanding among the general public as to what is being talked about here. The Higgs particle surely has nothing to do with “replacing” God or explaining the origins of the universe. It is about the fundamental, elegant, and beautiful way that the physical universe works. Clearly the phrase is an irresistible headline for the media despite the fact that physicists don’t use the term or approve of how it is being misunderstood. Such misunderstanding and craziness has given rise to widespread conspiracy fears that the CERN efforts might lead to the creation of a mini-”Black Hole” that would bring on the end of the world, spanning a host of films like “Angels and Demons” in which “antimatter” is set to destroy the Vatican. For a saner more informed overview of the 2012 4th of July discovery this piece in the Washington Post is among the best. You can also watch Peter Higgs himself explaining his theory on PBS’s Nova here. The clearest explanation of the Higgs particle theory I have found is this marvelous “cartoon” presentation by Jorge Cham. Watch it and you will be moved by the elegance of the theory, should it turn out to be fully established. James Tabor on PBS: What Is Immortality? If you are not familiar with this remarkable PBS series created by Dr. Robert Kuhn dealing with the “Big Questions,” namely God, Cosmos, and Consciousness, you can browse some of the past shows here. The group of experts he has gathered together is truly impressive, a virtual “Who’s Who” on all sides of every issue, with Kuhn’s probing skills as host bringing out their best. I am honored to have been included. Television does not get better than this. For further background reading on this topic see the links in yesterday’s post here.